Izzy (Isidor/Isadore) Einstein (ca. 1880 – 17 February 1938) and Moe Smith (ca. 1887–1961) were United States federal police officers, agents of the U.S. Prohibition Unit, who achieved the most successful number of arrests and convictions during the first years of the alcohol prohibition era (1920–1925). They were known nationally for successfully shutting down illegal speakeasies and for using disguises in their work. They made 4,932 arrests, of which 95% (around 4,680) gained convictions. In late 1925, Izzy and Moe were laid off in a reorganization of the bureau of enforcement. A report in Time magazine suggested they had attracted more publicity than wanted by the new political appointee heading the bureau, although the press and public loved the team. By 1930, both men were working as insurance salesmen. Early lives and educationsIsidor Einstein was born in the Austro-Hungarian Empire to a Jewish family about 1880 He grew up speaking Yiddish and likely was educated at a schul; he also learned Hungarian, Polish and German, together with a smattering of other European languages. He emigrated to the United States about 1901. Moe W. Smith was born ca. 1887 in New York to Jewish immigrant parents from Galicia in the Austro-Hungarian Empire. He went to public schools, and grew up speaking Yiddish and English. As a young man, he started boxing. About 1906, Einstein married Esther xxxx (b. ca. 1888, Austria/Galicia; imm. ca. 1891), who was also an immigrant from Galicia. They had at least seven children together, but two died young before 1910. Surviving children were Joseph (ca. 1910), Charles (ca. 1912), Edward (ca. 1914), Albert (ca. 1916), and Milton (ca. 1927). Before 1920 Smith married Sadie Strauch, a Jewish native of Bohemia in the Austro-Hungarian Empire, and immigrant to New York, who was a native Yiddish speaker. Moe and Sadie Smith (b. ca. 1891, imm./nat. 1898 or 1900) were then living with her brother, Benjamin Strauch in Brooklyn. Their daughter Estelle was born ca. 1925. Izzy and Moe were both rather round and apparently disarmed many of their quarry. They claimed to have used more than 100 disguises and never been detected. Izzy developed what he called the “Einstein Theory of Rum Snooping” (referring to the theory of relativity by the physicist Albert Einstein.) They frequently made arrests while unarmed. 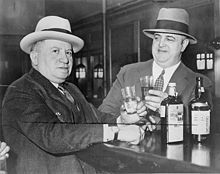 As Prohibition Bureau agents, they were the most famous and successful, known nationally for making thousands of arrests and gaining a high rate of convictions. They made 4,932 arrests, and achieved a 95% conviction rate. They confiscated 5 million gallons of liquor, worth an estimated $15 million. As a result of their work, thousands of bartenders, bootleggers and speakeasy owners were sentenced to jail. They used disguises to make their way into illegal bars, appearing as “streetcar conductor, gravedigger, fisherman, iceman, opera singer” and as the state of Kentucky delegates to the Democratic National Convention of 1924 held in New York, where they found only soda being served. They once went to a bar and identified themselves as Prohibition agents. The bouncer, thinking they were joking, simply laughed and let them in, where they proceeded to arrest him and everyone inside.